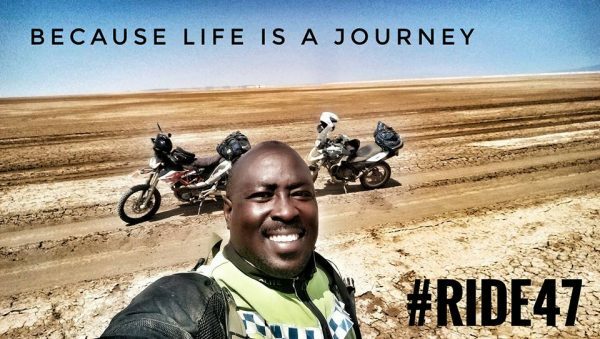 In September 2013, I was told by friends in the Nairobi biking circles of a pastor who was planning a motorcycle adventure to South Africa and back. I pictured a portly man in black pants, white shirt with collar and a weathered bag slung over shoulder containing his bible and note book. He probably rode a no frills 125 Cc Honda TVS, that was gifted by his congregation in recognition of his work ethic around the parish ministering to the flock. 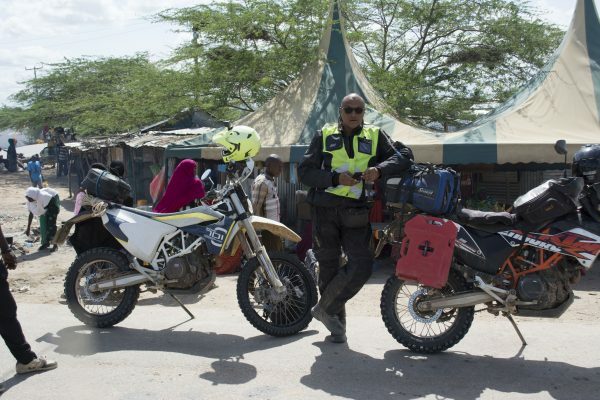 I had written a Motorcycle Travel column in a past life for the Drum East Africa magazine and naturally a sucker for a good bike travelogue. We eventually met up in a production office in Westlands for a brainstorming meeting to consider shooting a documentary of the ride. I realized that I knew so little about pastors. The pastor was not your average bible verse-spewing polite padre from the local parish. 38 year old, Pastor Nick Korir is charismatic. He strode into the office with his biker jacket and helmet in one hand with the swagger of a hardnosed adventurer. He began to speak about motorcycles with conviction, confident of success in his expedition. Two weeks later, Pastor Nick returned to the production office with an adventurer named Florian Keller who was about to embark on a 40,000 km journey in a 1997 Turbodiesel Toyota Land Cruiser, for 200 days, through 26 countries around the world, from Nairobi to Rio de Janeiro in time for the football World Cup in 2014 in Brasil. If no one had brought up his occupation, I would have not have been wiser. Nick Korir is an Executive Pastor of Nairobi Chapel who spent 16 years as a Youth pastor. The Chapelities have fascinating history as Christian outliers with a history dating back to 1953. The founders of the Nairobi Chapel in post independent Kenya were from the Plymouth Brethren and very non traditional. That nonconformist spirit has evolved into a evangelical motorcycle ministry. Pastor Nick has the leadership temperament of a team captain, one of the boys. His fellow bikers called him “Passy” in keeping with his easy going youthful nature. I have watched Pastor Nick preach to hundreds, dressed in a combat jacket and beret. On a different occasion, I watched astonished as he led bikers on their roaring bikes into the tented church for a thanksgiving session. When he was not preaching, motivating and leading at the Chapel, he is riding his bike. Nick is the current Chairman of Motorcycle Kenya, an umbrella organisation that brings together private motorcycle clubs and advocates on a safety culture for motorcyclists. To say he is passionate about bikes would be a gross understatement. Biking was not a phase of his life. It was his life. Nick started riding bikes when he was 14 years. His first bike was his dad’s Suzuki Scrambler 125 Cc. The first bike he owned was Yamaha Tenere 600 Cc, then he bulked up to a BMW 1200 GSA that made the trip South Africa and back. 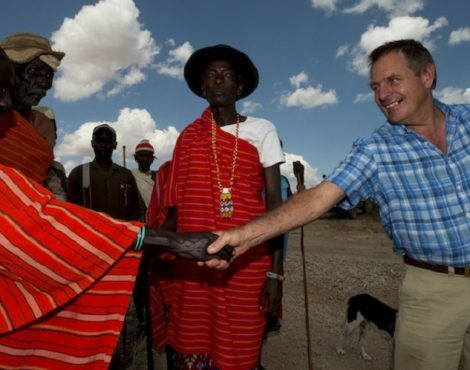 His wife Julia Wangui said in an interview that Nick had been talking about this trip since they got together in 1997. By November of 2013, he had gathered six serious bikers to commit to the long ride down south. The ride was timed to be in sync with Kenya’s 50 year anniversary on the 12th of December 2013 and they called it the Jubilee Ride South ( No affiliation to the political party Jubilee). 7 brave men set out to ride on a epic journey of 12 000km through 12 African countries in about 50 days to raise funds for 50 school going children. The target was 15 million Kenya shillings that would cover the fees of 50 pupils through 4 years of high school. The seven men all past their youth took a month off their day jobs for the adventure challenge. 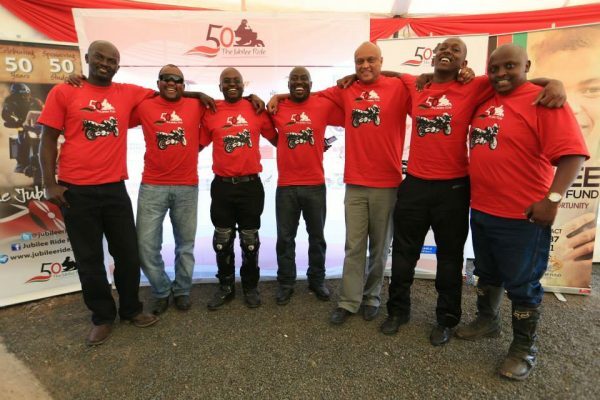 The band of bikers comprised Pastor Nick Korir, Mbeche Alwanga, John Kithinji, Mburu Ngugi, George Mbuvi Mwongela, Moses Nderitu and Danzo Mutunga. There were three BMWs: 1200 GSA, F 800, 650 Dakar, Two Yamahas: FJR 1300, 600 Tenere, One KTM 990 and One Honda Africa Twin. It has been 4 years since the Jubilee South ride and I meet Pastor Nick at a Java coffee house in Valley arcade, Nairobi for an interview. He has recently returned from a cross country adventure. Riding through all of Kenya’s 47 counties. 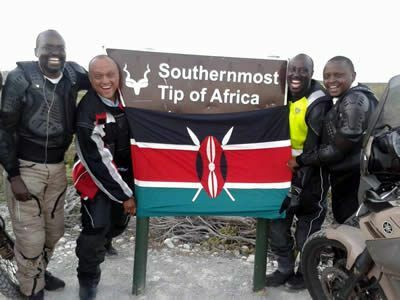 Since his epic Southern trip, several Kenyan and Ugandan bikers have done the long route down to South Africa include a young Kenyan biker on a 180Cc Honda TVS. Pastor Nick has adventure stories for days so I asked him to share his travel journal from the Jubilee Ride South, 2013-2014. 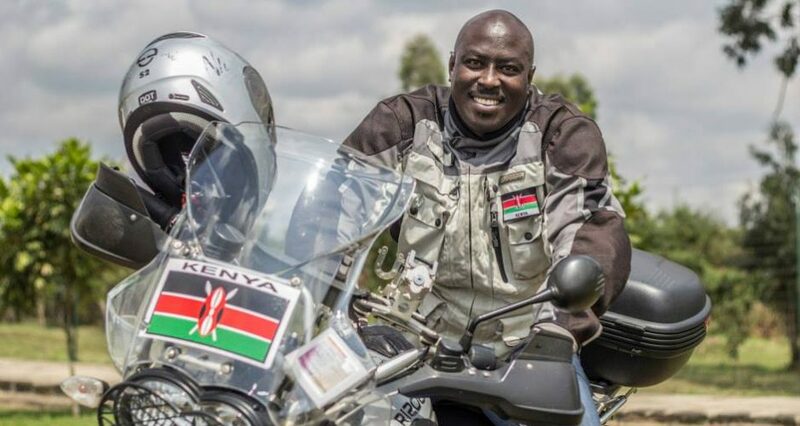 That probably earned him honour of the first Kenyan pastor to have ever ridden to Cape of Agulhas and back to Nairobi through 12 countries covering a total mileage of 23 000kms. 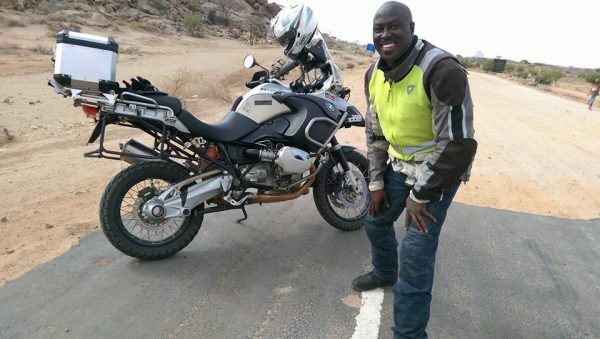 This is a travel account about how a pastor became the unlikely face of adventure riding and Pan African travel in Kenya. “You look at where you’re going and where you are and it never makes much sense, but then you look back at where you’ve been and a pattern seems to emerge. And if you project forward from that pattern, then sometimes you can come up with something- Robert Prisig. ? The Jubilee Ride South Journal. Do you remember the starting point? It was raining on the morning of 12th December 2013. Nairobi was dull and grey but members of Nairobi Chapel showed up to pray for bikers and wish us journey mercies. The plan was to ride through Tanzania, Malawi, Zambia, Zimbabwe, South Africa, Namibia, Botswana, Zambia, Tanzania, into Kenya then onto Uganda, Rwanda, Burundi and back to Kenya. We were escorted out of Kenya with tens of bikers and it was good company until we crossed into Tanzania at 6pm and just the 7 of us were left on the long road to the south of Africa. The customs process took longer than we had anticipated and we were cleared late. We arrived in Arusha at 8pm in time for the Golden Jubilee Dinner organized for all the Kenyans living in Arusha at the Kibo Hotel by the Kenyan consulate. Tanzania would prove a challenge for the speedstars. Moses was busted twice for speeding, or you could say riding at 54 km per hour in 50 zone. Moses continued with his speeding ways and on the day we left Iringa, he decided to throttle to 180 on a 30 km zone. Two cops run to the side of the road hoping to stop him but the time they raised their hands, Moses had blast through at the speed of sound. The rest of bikers trailing him, obeying the law, were flagged down and given a tongue lashing as collateral offenders. 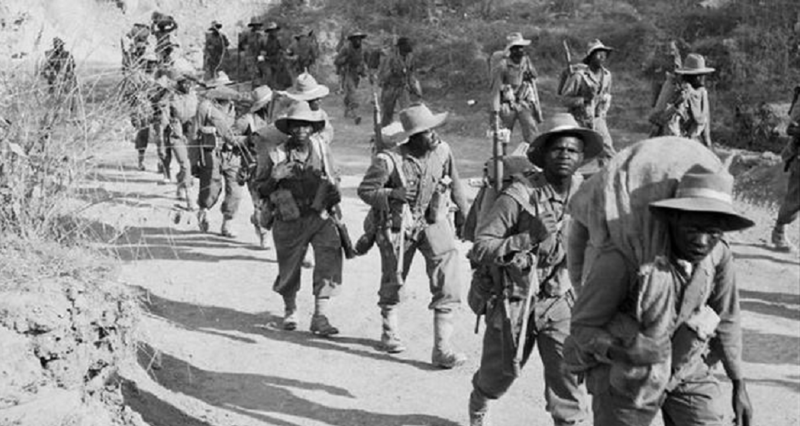 John also bullied everyone to going to see the Dodoma Parliament because he was actually a history buff and the most well informed of the entire crew. Mbeche declined and decided to wait for us at a roundabout. He took a short nap that lasted an hour. Then was startled awake by an accident that happened in his vicinity. He got on his bike and rode off in the wrong direction for another 1 hour! on the wrong exit from Dodoma. We rode for two hours without spotting Mbeche and started getting concerned. Then suddenly a bike passes us clocking 200 and everyone said, “There goes Mbeche”. He arrived in Morogoro before everyone else. On Sunday the 15th December 4 days on the road, we left Iringa for Mbeya on the border to Malawi to cross at Songwe border post ( Tanzanian-Malawi). John prayed for the group that day. Had to mention that. We rode to Karongo where we spent the night at Taj hotel that sat next to the lake Malawi but had no running water. When we asked why, we were told the waterboy was not working today. We asked if we could fill in for the waterboy then. Well apparently, they were talking about the water board. 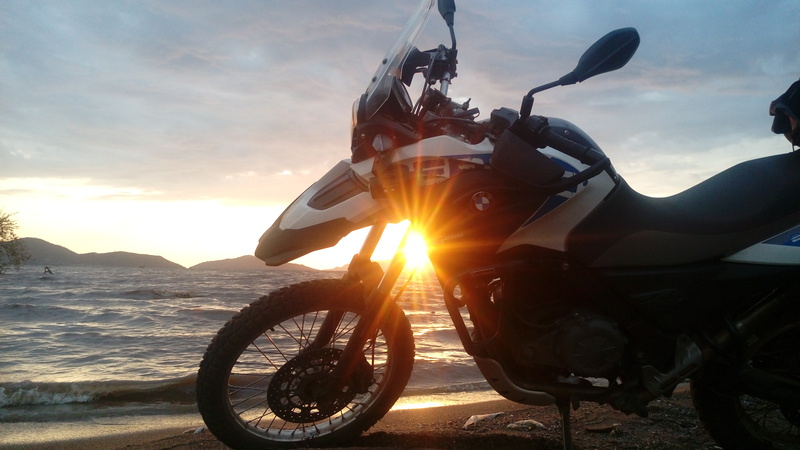 Riding along lake Malawi was totally gorgeous! We stopped at fishing villages and played with monkeys, walked on a 110 year old bamboo bridge that was constructed in 1904, had an encounter in a traditional shrine with the traditional gods of the Malawi, and enjoyed the best twists ever as we weaved through the mountains to Mzuzu on our way to Nkatha Bay. We found this amazing beach resort called Mayoka Beach Resort with a combination of thatched cottages and green vegetation that has a lake front and a breathtaking lake view! This was the first time on day 5 of this trip that we had WiFi and so everyone got onto their gadgets to try and catch up and update their friends and family. We left Nkatha bay at the crack of dawn to a gloomy morning, rode past a sad looking cleared forested area, then through the central part of the country towards Mchinji (the border). We avoided the capital city (Lilongwe) to save time and cover a shorter distance on this day. Moses was the first on the queue and after him we got royalty treatment and no issues at all from the female border guards. When Mwongela asked Moses what he had told them, apparently he said, “If you are what Zambia is going to be like, I think this is a very good country”. We crossed the border and decided to only ride 100 kms past Chipata Town into Zambia before finding a place to rest for the night. We slept at Katete Town and it took us 2 hours to find accommodation after looking at several options that were super expensive and very dilapidated. What do you remember about Zambia? The ride into Lusaka was monotonous. It was mainly small villages and not too many scenic landscapes through rain. We got our first encounter with a Zambian delicacy: fried Caterpillars! We stopped at gas station and found a man with a paper bag containing caterpillars. He said they were for eating and we said, Ayiee! and made faces. Some brave souls soon discovered they were really tasty and actually edible and even carried takeaways. We arrived in Lusaka when it was raining and by the grace of God we bumped into the Kenya High Commission Vehicle and taken to the Kenya High commission in Lusaka for a courtesy call and a connection with the Kenyan community in Zambia. That evening we had a taste of Kenyan tea and later on settled in Lusaka for the night at Mr. Kariuki’s (a Kenyan) Kalahari Guesthouse. The rooms had bathtubs! In Zambia, Danzo tired of being called a slow rider, decided to bomb on the roads and rode so hard his bike caught fire. Mbeche passed him and told him “Danzo, you are on fire” and he responded with a thumbs up sign. Little did he realize that his bike had actually caught fire. Then you rode into Mugabe’s country. It was a short ride from Lusaka to the border in Chirundu to Zimbabwe. This was our first one-stop border stop that had immigration and customs of two countries all in the same building – excellent idea! However this was our worst border crossing because the clearance process was longer than the rest. We spent 3 hours trying to clear the 7 bikes and the 2 cars! The immigration demanded letters we did not have and demanded that we pay road toll that we had not paid in our port of entry in Chipata. It delayed our arrival in Harare but at least we saw elephants and baboons at the immigration border! We got totally drenched by a downpour as we rode into Harare. On arrival in Harare a very weird thing happened. 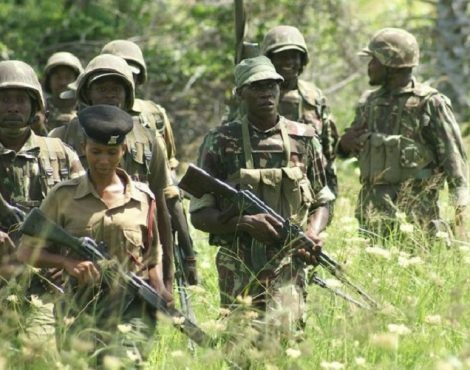 We had parked right outside the Harare Westgate Mall to wait for the team to catch up and some army officers came to interrogate us on suspicion that were terrorists! They called the police to check our documentation and travels plans and found no issues before they let us go …bizarre? In Harare we were received by the Kenya High commission and hosted for dinner at Mbuvi’s in Harare. We later on went to spend some time with the Survivors Motorcycle Club Bikers Club of Harare and visit their 4-year-old Bikers Pub. Is there a huge biking culture in Zimbabwe? Yes, we even met members of the Christian Motorcycle Association and discussed beginning a chapter in Kenya. We had close to 20 bikers riding with us out of Harare until we were safely on the highway to Bulawayo. John the historian had insisted that we had to see the Great Zimbabwe ruins. It is on the way, we just need to turn off kidogo he assured us. We rode for over an hour and found the park closed. But we pleaded with the guards that we had come from too far to see the ruins and they let us in. Afterwards, we rode through the night and got to a hotel near Beit Bridge at 11.30pm and settled in at the Lion and Elephant Lodge for the night. Finally. We rode 80kms to the border and began the process of immigration and customs to get into South Africa. The process was clear but long, no drama though (gladly) this was a true miracle as we did not have one of the required letters of authority and it was not asked for! All our bikes got cleared by 12 noon and we began the ride through Polokwane to Johannesburg. The moment the crew entered South Africa and you know immediately that you are in a different country, The roads just change. Side walks, large highways, motorist are courteous, then the signage… totally enjoyable cruising down the highway. That evening, we were arrested for the first time by the South African Police – one of the bikers had a tail light bulb that was not working and it took us an hour to get released to continue to our rest day. We got to Jo’burg at 8pm and checked in anticipating the Christmas break: The many toll stations on the highway in South Africa was a surprise for us as we spent more money paying tolls than on buying fuel money. Our wives had come to join us and it was great company. In Jo’burg we met a leader of the Soweto Bikers club who rode with us and invited us to their club for a courtesy call. At the end of the Christmas break rode 500 kms towards Durban. We took the scenic farming route and enjoyed the picturesque landscapes of Kwazulu Natal. We arrived in Pietermaritzburg before dark and decided to spend the night there before setting off through Durban to Port Elizabeth. We got to visit Nelson Mandela’s Home, Burial place and museum. It was very significant for us. On 31st December we rode from Port Elizabeth to Bredasdorp all the way down to Cape Agulhas. It was epic seeing the southernmost tip of Africa and figuratively reaching our destination. On the way from the Cape Agulhas, we had a very dangerous mishap. A lorry was passing Mburu and it dropped a pole. Mburu was carrying his wife Wachira and they hit the pole at top speed and found themselves airborne. 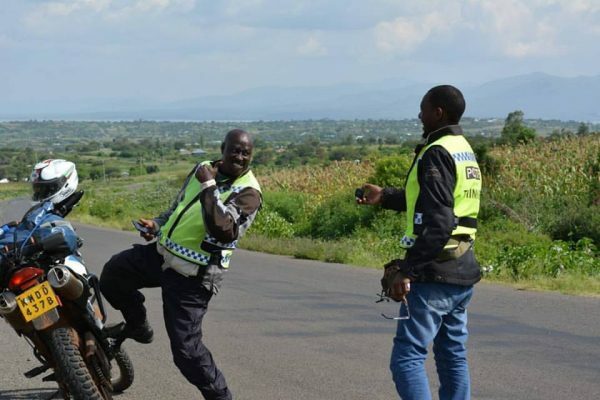 Fortunately they landed right back on the bike and Mburu slowed down with a display of mad skills. It damaged his rim and it was one of those freak road moments. It was a very long ride across South Africa into Namibia. We had to make it into Namibia and hence we were grateful for a very smooth border crossing at Noordower Border. On this stretch, John fell asleep on the bike from fatigue at 120Km/hr! He drifted off the tarmac and had nasty fall but we thank God that it was a few bruises and tissue injuries. Not to mention an oncoming 16 wheeler that by God’s grace managed to stop 20metres before his bike lying on the road. After quick first aid, he was rushed to a nearby hospital for further checkups and medication. The bike was not badly damaged, only a few grazes on the side and a bent rear brake pedal. We later spent the night at Grunau which is an old train stop that later became a town in the southern part of Namibia. The ride through the Namib Desert was a spectacle. Authentic, raw, indigenous and untamed. We rode on the straightest roads we have ever been on and horizon after horizon all we saw was straight highways. We hit our highest speeds in the trip as the roads were uninhabited and had no traffic police. I rode 250 kms into the desert because I only had 550Kms range on the fuel on my bike and had not carried any extra fuel with me to feel what Moses (of the Israelites in the bible) felt in the desert. The desert was surprisingly beautiful. We had a bird’s eye view of the Windhoek as we rode into the city and the celebratory arrival and reception by the Kenyan High Commission in Windhoek, was voted by the team as the warmest reception we have received into a country! The entire embassy staff waited for us on the highway into the city with flags and banners to receive us and escorted us for dinner at Joe’s Grill courtesy of the Kenyan Mission! We were also booked into awesome apartments for a night in Windhoek. Moses had trouble with his tires leaving Namibia, delaminating a section and in the process extensively damaging the number plate. However it was still safe enough to ride at a slow speed until we reached a town where we could get help to replace the tire with a new one. We rode towards the Namibia-Botswana Border crossed to Botswana at Mohembo Border post and we finally spent the night at Gumare after a brief stop at the Okavango River. We rode through the Okavango Delta and got to see the tributaries and the rich and green ecosystem that surrounds the delta. We were a little disappointed because we were told you needed to see the delta from the air to really appreciate it. We rode through the cities of Maun and finally spent the night at Nata. The next day, we took a slight trip detour and rode to the south of Botswana to tour the sand dunes of the Kalahari desert in the southern tip of the country. The ride was long and hard and covered over 1,000kms of riding. Then through Gaborone and Francistown to Nata. We rode from Nata to the North-West border of Botswana and Zambia at the Kazungula border crossing. We did about 500 kms through the national park and almost hitting elephants, ostriches and wildlife crossing the roads. Elephants were roaming around freely. This was the first border that we have had to cross over a ferry. The ferry crosses the great Zambezi River between Botwana and Zambia. We finally arrived in Livingstone which is just an hour’s drive from the border. 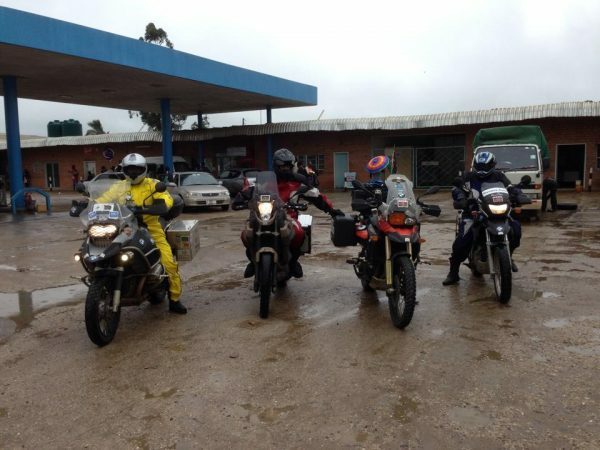 Next day we rode from Livingstone to Lusaka on a very wet day. The Livingstone – Lusaka Road is not busy. The highlight of the day was a reception by the Lusaka Bikers Association at Kabue … 50Kms from Lusaka. About 20 bikers rode down to receive us and ride with us in the rain into Lusaka. On Day 33, we geared up for the final leg back to East Africa. We set off early from Lusaka because we had to cover as much distance in order to get as close to the Tanzania border as possible. It was a wet day and made even more difficult by the foggy conditions on the road. We finally got to Sekeje Town at 5pm and the team was totally spent. Next morning we set off early to the Tunduma Border by lunchtime. The border crossing at Tunduma was smooth, but we unfortunately got a puncture on one of our bikes just after the border. This significantly delayed the team as the puncture recurred again hardly 10kms into Tanzania and we had to ride back to Tunduma to fix the puncture again. After an elaborate repair job the team set off for Mbeya Town and arrived late into the night. That is where we spent the night. 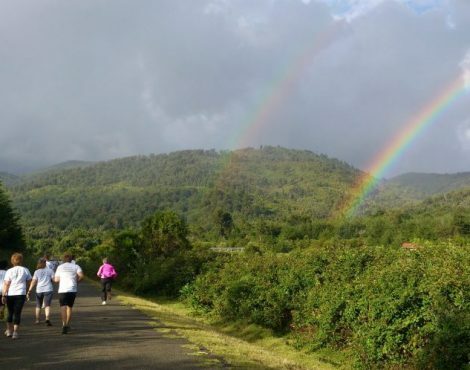 Next day we took the scenic route to Morogoro town, through the hills of Mbeya, down the valley of Iringa and up to the highlands of the Morogoro. The twisties just before Morogoro town were a real treat … all of us trying to get as low as possible to the ground as we hit the bends while soaking in the amazing landscapes. It was also quite a fast ride to beat the dark and get to Morogoro before nightfall. Next stop was Arusha and then we begun to smell Namanga. How was it to be back where you started? It was emotional, 38 days later on 18th of January 2014 and we found a huge welcome party at the border including media coverage. Funnily enough one of the bikes broke down just after Kajiado. Thank God it actually happened when we were already back into Kenya! We all got home safe that evening thanking and praising God for a successful 2nd leg of the trip! When did you get to complete the rest of the trip through the remaining East African countries? After 4 days of rest and Day 44: Mwongela and I rode through Narok and Kericho to Kisumu where we took a lunch break at the Dunga Beach. We had to spend some time fixing a puncture at Dunga Beach before departure to Busia. This delay caused us to arrive late at the border, but God prepared an immigration officer (Winnie) who went out of her way to ensure we were cleared in record time and accorded VIP treatment. We were done in no time and ready to ride to Jinja where we spent the night. We rode from Jinja to Kampala to meet up with the Uganda Bikers. 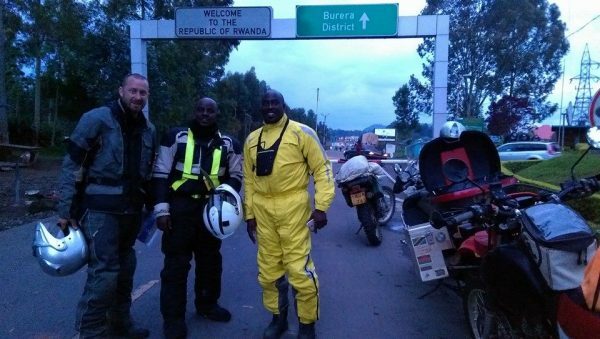 They escorted us out of Kampala with a brief stop at the Equator and then we rode towards the Uganda- Rwanda border at Gatuna and crossed over to Kigali. 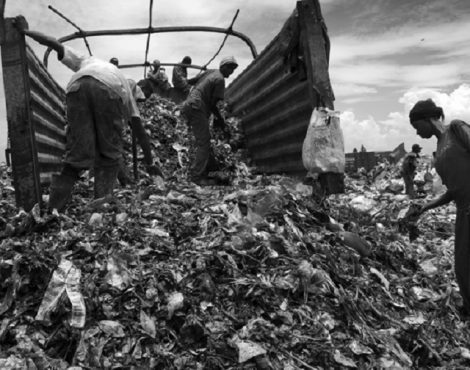 I am told the Rwandese are stickler for cleanliness? In all the countries that we traveled to, no one bothered with our panniers. But once we got to Rwanda, they got thoroughly searched and emptied. Rwanda has a a very stringent no plastic bag policy. I met up with the Kigali Bikers Association and rode out of town with them for 60kms to a resort where we had an excellent lunch while listening to live Rwandese music. Next day we rode from Kigali through the Burundi border to Bujumbura. This was the most curvy ride we had encountered in the whole trip. We navigated the hilly landscapes, up and down the hills and valleys through a number of towns along the way. Rwanda has hardly any traffic or traffic police so the ride was hardly interrupted … It was excellent. We crossed into Burundi at Kanyaru Haut and encountered heavy rains as we got into Bujumbura City. The view of the city as you ride in from the surrounding mountains is amazing with the city lights and its close proximity to Lake Tanganyika make it a spectacle to behold! What goes on in Burundi? Bujumbura is an amazing city set by the shores of Lake Tanganyika, the only sensible thing to do the whole day was to tour the Lake. We had several stops at several resorts along the lake and it was just amazing being so close to the Congo and touring its shores. We set off in the morning from Bujumbura and conquered the winding hills towards the central part of the country toward the Tanzanian border. 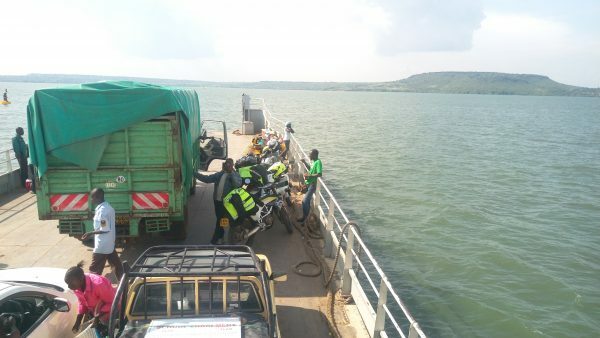 The border crossing was seamless and proceeded to the longest off road stretch of the trip, 70 Kms short cut towards Mwanza; which would cut 6 hours of our journey as we tried to directly connect with an adjacent tarmac road that leads to Mwanza Town instead of riding a round loop. We arrived at the ferry just before Mwanza town at 5pm. It took us an hour to cross with the ferry and we safely rode into Mwanza town at 8pm. The final day! This would be one of the shortest and least technical rides as the Mwanza to Isebania Road runs through the Serengeti and it is a new and very smooth tarmac road. We rode over the Mara River and saw animals along the way as we crossed the Serengeti National Park. We got to Kenyan border at 12 noon and enjoyed a very warm welcome from the customs and immigrations officials and it was great to be back home. We then rode through Kisii and Narok and finally got back to Nairobi. Did you any issues with visas? I did not have any problems with Visas because we decided to go through Commonwealth countries. COMESA and the EAC have in place treaties that make it easy for Kenyans to travel through these countries. As far visas go, Namibia and South Africa had the most stringent requirements. In South Africa we needed a temporary import permit for the bike. Zambia had a weird carbon tax. The thing is that with bikes did not need a CARNET De Passage guarantee. All one needs is a logbook to show ownership and to ensure that the bike is registered to the owner. Talk about the people and sights? Rwanda is the most scenic. It is the country of a 1000 hills. We found it wet in Zambia. It rained for three quarter of the time. Zimbabwe was quaint. Botswana was lonely. A population of 2 million people in a country that is as large as France. 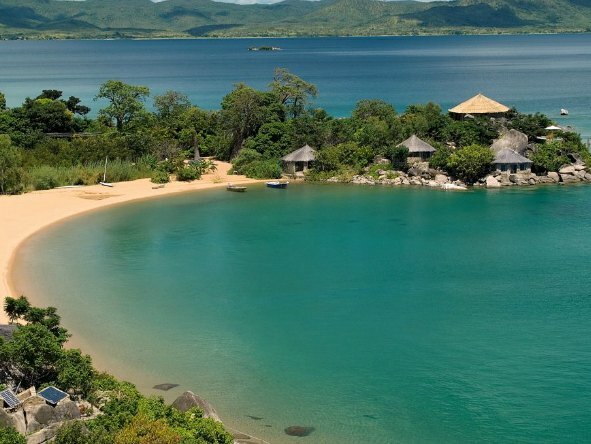 Malawi was the most hospitable country to visit. It was seemingly the poorest but it had the nicest people. It was also the cheapest country to stay in. East Africa feels like one country. Things are very familiar. The impact of western culture is felt greater in Southern Africa. Rwanda and Burundi, display that French flair. Even common folk dress very formally. In Rwanda everything is done by the book. They are very strict about the business. The best riding roads are in Southern Africa. From South Africa, Namibia Botswana. Tanzania has the best roads in East Africa. We were impressed by Tanzania. Roads were good, towns like Iringa were clean and fairly organised. Uganda has the busiest roads. Riding through Kampala is crazy. The population is dense and so is the traffic. In Tanzania we have to speak in upgraded Kiswahili. We did not go to Mozambique or Angola because they do not speak English. They speak Portuguese and the visas would not have been as easy. But we could use English throughout apart from Burundi, it is Urundi and French. In Rwanda, we were surprised to find a large contingent of Kiswahili speakers. 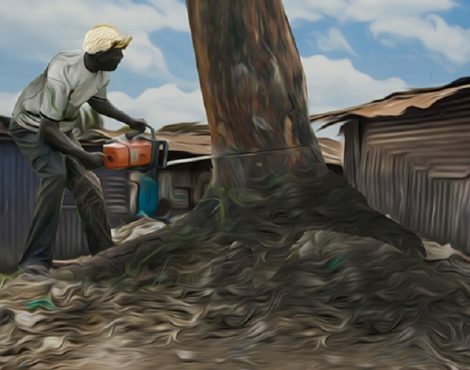 In Malawi, people spoke the Queen’s English. Most people had never seen Africans on adventure touring bikes. We were met with surprise every time we removed our helmets. They always asked whether we worked for a company. Adventure biking is for white people, we were told. Lessons learned and would you do this again? We were naïve in this first trip and we ventured out in blind faith, did not do enough due diligence chasing the spirit of adventure. In 6 weeks on the road, a brotherhood was established. We fought from the 2nd day went through all our issues. It taught us that if we focus on doing something, it is possible. Since December 2013, the flood gates have opened. Many travelers have gone down including a guy on a 180 Cc bike. What important aspects did the Jubilee ride reveal about yourself? The Jubilee Ride showed me the extent I can go to achieve a goal because I was willing to do everything within my ability and resources to make this dream of riding to the Cape and back, a reality. Did the Jubilee ride serve as a metaphor for your ministry and in what ways? The Jubilee Ride redefined the possible for us and flung open the doors of possibility where adventure and creative fundraising to support the Logos Scholarship Fund is concerned. What is your advice to young men and women who are interested in motorcycle culture? All our passions are time bound. I would begin as soon as I get an interest in motorcycles and spend the rest of the time developing and exploring the full extent of this passion. Kindly share details of the next trans African adventure? In 2018, we hope to tour North Eastern Kenya, Somaliland, Djibouti, Ethiopia and the Lake Turkana Region. In 2021, we hope to ride round the Coastline of Africa from Mombasa, back to Mombasa. This article is produced in support of the #VisaFreeCitizens Championing For a Visa Free COMESA. The contents of this article are the sole responsibility of the author and cannot be taken to reflect the views of the ACP Secretariat and its Member States governments, the European Commission or the International Organization for Migration. Time To Kick My Plastic Habit. Why are all the black faces in conservation in the background? What an article! what an adventurous ride. Amazing. Just picked one of your pictures as my wallpaper coz i love biking. Thanks Machuku. Find pastor Nick Korir on Facebook. He is a highly resourceful and all round cool guy. My youth Pastor in Parkie before he joined chapel, a very real and one on one mentor.